Sealco’s pneumatic sewer plugs (segmenting, plugging, total testing and by-passing) are unique field proven devices. Heavy duty construction and improved modular design greatly increases life and performance as compared to competitive makes. Natural rubber body element bonded to a resilient aluminum cylinder expands and contracts whenever desired yet returns to its original size and shape after thousands of inflations- resists breaks, cuts and punctures. In the case of a damaged plug due to improper handling, Sealco carries a full line of replaceable parts to save you time and money. 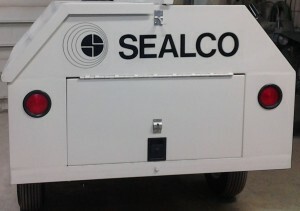 You can slash your plug inventory by 50%, for Sealco’s unique design allows you to seal off two or more diameters of pipe with one plug.